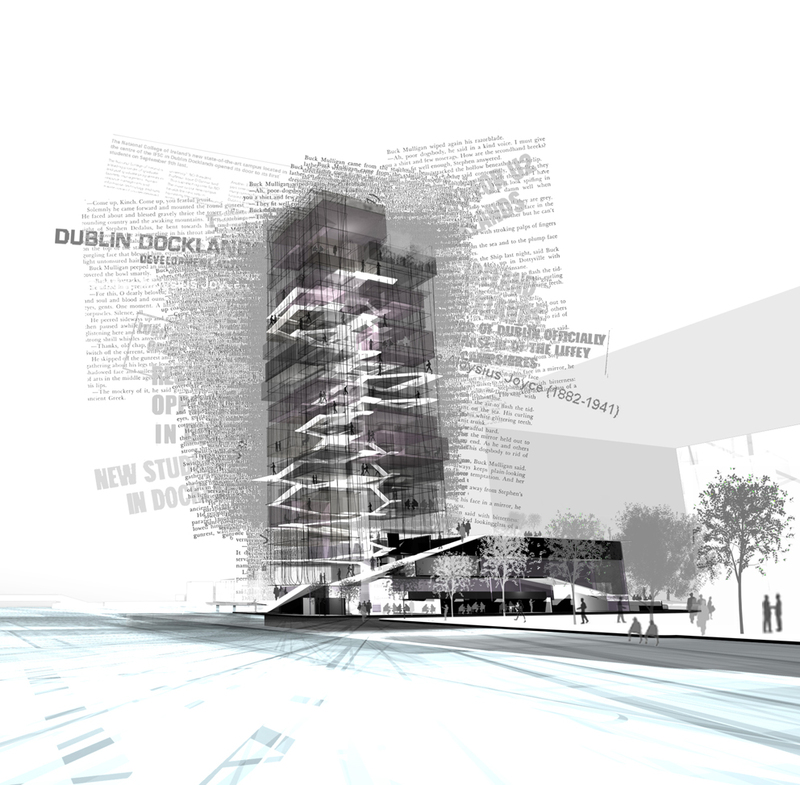 Design competition for a residential / commercial tower, podium and U2′s new studio. 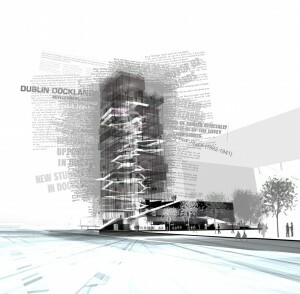 The project was imagined as the centre piece of the Dublin docklands regeneration. With Jennifer Chen and Andy Chen. It was proposed to fold the city streets, the public spaces and parklands of the docklands campshires, from an active engagement with the river, up through the height of the tower. 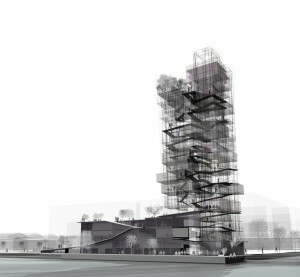 The trajectory between the river and the stacked program of the tower is facilitated by a continuous ramping. The network of precast ramps provides circulation between the floor plates and is utilized to transfer loads to the structural skin. The spiralling public route, which facilitates programmatic exchange, forms the silhouette and image of the buildings as a new marker on the skyline. The vitality of the tower is seen through and across the buildings own ‘songlines’ and provides a fitting notation for the collision of future aspirations and industrial working heritage within the docklands regeneration. Walter Benjamin’s essay on Naples, written in the mid-1920′s explores a set of fundamental relations between architecture and urban experience drawing on the central concept of ‘porosity’ – the blurring of boundaries, a permeation or intermingling of one thing by another, a merger of, for example, public and private, sacred and profane, past and present. Porosity links architecture and action or movement, in particular the improvised character of everyday life as dramatic performance – theatre, story and song. Naples rises from the rock where the chalk cliffs meet the sea. ‘ As porous as this stone is the architecture.’ Building and action interpenetrate in the courtyards, arcades and stairways. In everything they preserve the scope to become a theatre of new unforeseen constellations. ‘This is how architecture, the most binding part of the communal rhythm comes into being here’. From the docks, taverns and markets of the shoreline the tenement blocks rise in tiers. They ‘appear against the villas as skyscrapers with rough hewn streets and staircases climbing their foundations to erupt fragmentally from buildings, make an angular turn and disappear only to burst out again.’ They become place of encounter and exchange. To Benjamin, ‘everything joyful is mobile’. Music parades about, the broad cart hung with song texts, the calls of traders and the craftspeople and dock workers – ‘the brilliant sounds of the street’. In James Joyce’s Ulysses, Dedalus insists that tapping the potential of the city and by implication the source of life, comes by being aware of the ‘shout of the street’ – the city as a community of people moving through a landscape. The street is also a place of entry before transit or ascent by a lift or stair to a higher point where it becomes a vertical cul-de-sac in a tower, which has a limited relationship with the ground and remains closed and static. 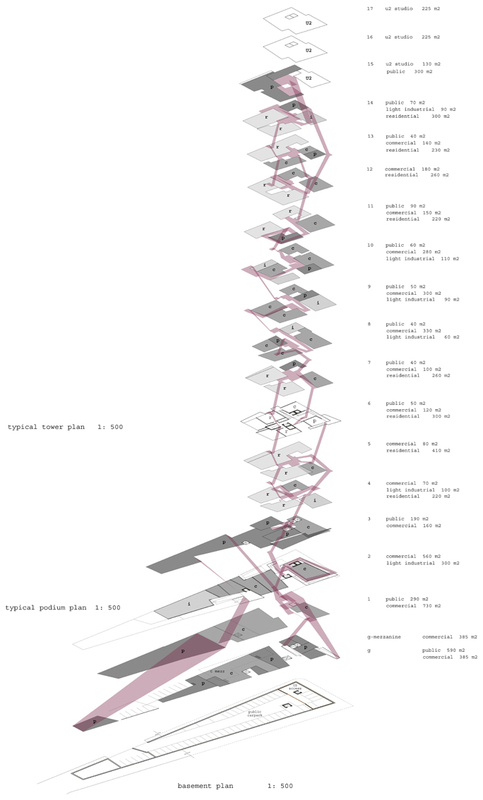 Lateral movement is restricted by the edges of the building and the confines of the lifts or elevator – the antithesis of the public space and interconnected streets of the labyrinthine city. We propose to fold, the city streets, the public spaces and parklands of the of the docklands campshires, up from an active engagement with the river and thorough the height of the tower. 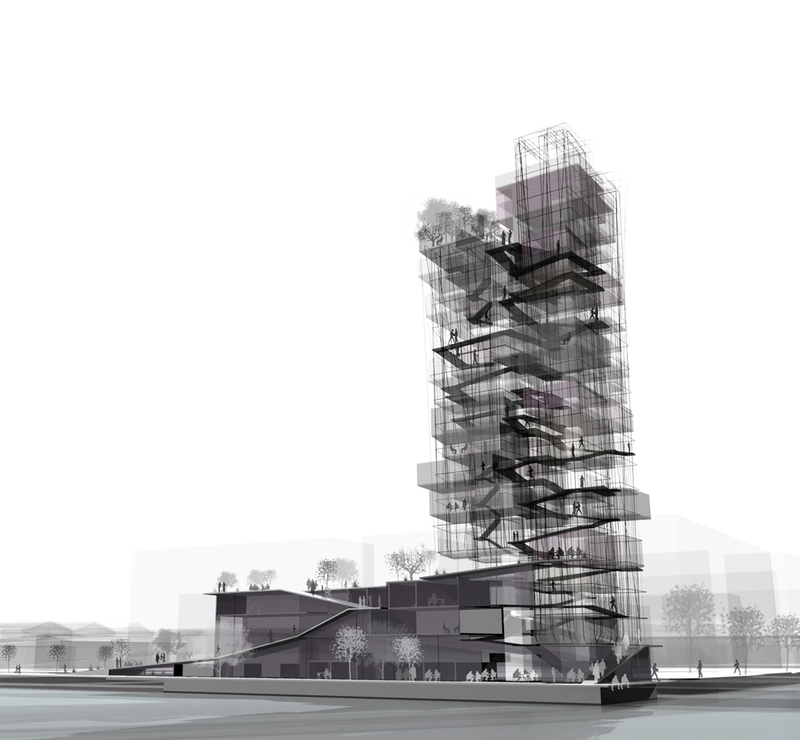 The trajectory between the river and the stacked program of the tower is facilitated by a continuous ramping. 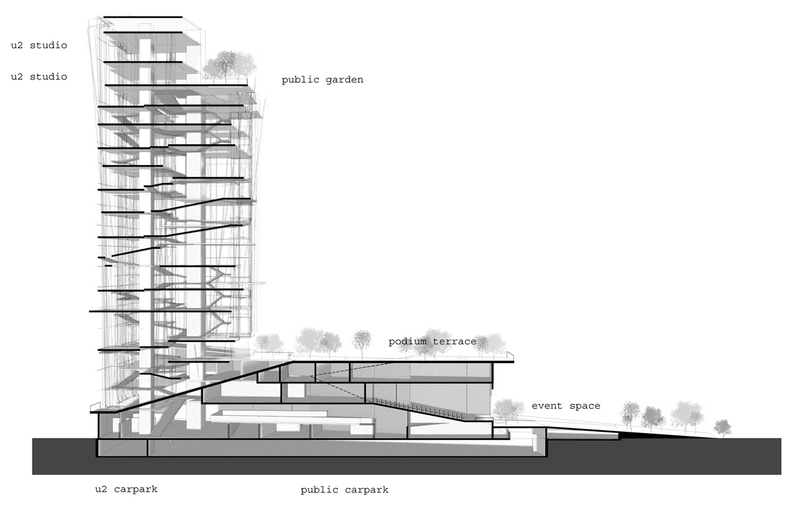 A labyrinth of ramps and green spaces at the various public strata afford the tower an interlocking system of voids that bring daylight, air and vegetation down through the depth of the tower. The roof of the podium becomes a public park that floats above the dockland streets. The end point of the pathway is an urban scale roof terrace and sky garden enlivened through various public programs. Here the visitor is afforded a view back over the docklands and out across the water, looking back down through the tower to trace the route they have taken. The movement routes are multicursual, a palimpsest of pathways through programmatic elements. The visitor, resident or worker can meander, explore, play or rest. A secondary system of private routes and shorts cuts, to service residential sectors, keys into the main pathway. Direct functional access through the tower is provided by two central lift cores. The presence of people and the choice of routes form a self-policing strategy that mediates between public, semi public and private spaces. The labyrinthine quality of the ramping provides the opportunities for chance encounters and meetings as paths cross and intersect – a theatre of future possibilities in the merge of past and present. The grassy ramping and the stairs of the public spaces leading from the river form a venue for water based recreational activities but also performance spaces, speakers corners, places for storytelling and song that flow on up the ramps of the tower and out from workshops and music venues. It is here that the older residents meet the children engaged in music and movement and the creative transformation of waste materials, in classes and crèche; the young Irish writers cross paths with the journeyman, the sailor and the working class histories of the docks and the lock; the stories told by the san nos musician intermingles with the electronic sounds of the nightclub and contemporary band; craftspeople practicing the old skills that built and served the docklands will meet, on the ramped pathways and park areas, the info-technician, the avante garde designer, the commercial speculator – the people who work, play and live here. In these meetings a redemptive ‘third space’ of ‘porosity’ between tradition and modernity is found in the possibility of new stories and new songlines. The organization and aspirations of the building have a visible presence. The spiraling public route, which signifies programmatic exchange, forms the silhouette and image of the building as a new marker on the skyline. The vitality of the tower, seen in the movement of people through and across the buildings own ‘songlines’ – provides a fitting notation for future composition and improvisation in the regeneration of the Docklands.